The wait is finally over – The much awaited Google Nexus 5 smartphone and Nexus 7 tablet is now available in India on Google Play store. 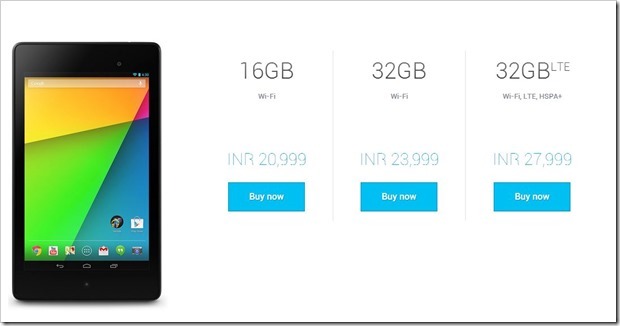 While many expected that only Nexus 5 will come only in 16GB version in India, that is not the case. Even the 32 GB version is available that too in both black and white colors. The 16GB version has a price tag of Rs. 28,999, while the 32GB version has a price tag of Rs. 32,999. And shipping is quick as well – according to play store, Nexus 5 gets shipped in one or two days. Even though there had been rumours of Nexus 5 launching in India, I had not expected it to come so early. 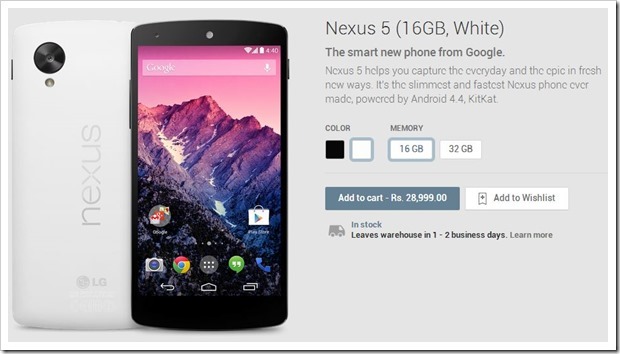 yes, Snapdeal and few other sites did list Nexus 5 for pre-orders, but I was quite apprehensive about the launch, given the track record of Nexus devices in India. Kudos to Google for making it available so soon in India. And it is not only Nexus 5, even Nexus 7 tablet is also available in all its glory. All 3 variants of this powerful tablet are available. The 16Gb version is available for Rs. 20,999 and 32GB version has been made available for Rs. 23,999. Surprisingly, even the 4G or the LTE version is available in 32 GB variant. As for specs of both the devices, it is suffice to say that they are absolutely top of the line. With both of them featuring Snapdragon Quadcore processors and 2 gigs of ram, there will hardly be any app or game that will break sweat on these powerful beasts. Being a Nexus 4 user for over a year, I can safely say that if you are looking for a top end smartphone or a tablet, there is no better choice than these devices. Go for it! Just make sure that you have credit card as no other form of payment is accepted on Play Store! Billionaire Investor Azim Premji To Debut In Ecommerce Space With Myntra.com?